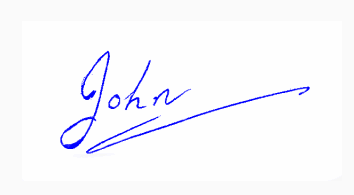 Animated Signature, particularly digitally created realistic animated signature in hand written text looks great, suits blog post ending or in forum signature. There are various ways to create this kind of realistic hand written animated signature, we will describe two in details and mention the other ways. But we will try to find the nearest or closest ways to get a realistic hand written animated signature for free. Most commonly, Adobe Photoshop like software can be used with or without ready made action script to create such realistic hand written animated signature of your own. But we will not describe that way in details. Second way is to pay that person and tolerate his “I reserve the right to refuse a request if I have a backlog or other commitments.” disclaimer ! In other words, if the name is difficult to animate to look great, he/she will be busy. That is what probably you will not love to follow the way. So basically you can combine it with Google Fonts API, follow the way we described to load any font from Google library (do not use the combine animations, I am pointing towards loading a handwritten font). So you are importing a hand written font and animating it. in their text field and set a bit angle, and got it as ready made GIF file. The reason is, as infinite loop is needed to set, without dot the A of my name starts too fast, others are to add a realistic effect. Most will like this shortcut to get a realistic hand written animated signature for sure. This Article Has Been Shared 8634 Times! You can fetch your Twitter account’s tweets as RSS feed or the get the JSON’s url with this nice and easy trick. Cite this article as: Abhishek Ghosh, "Animated Signature : Free Realistic Hand Written Animated Signature," in The Customize Windows, October 19, 2012, April 21, 2019, https://thecustomizewindows.com/2012/10/animated-signature-free-realistic-hand-written-animated-signature/.